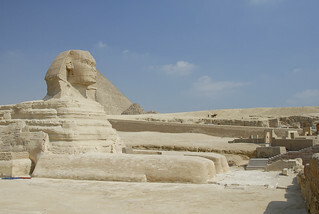 The Giza Necropolis is located in the Giza plateau, near Cairo, Egypt. This necropolis of ancient Egypt were built the pyramid Jufu (Cheops), also known as the Great Pyramid, Pyramid Jafra (Kefrén) and the relatively small pyramid Menkaura (Micerino), along with several subsidiaries under pyramids, temples funeral and the Great Sphinx of Giza. Associated with these monuments are numerous royal courtiers of mastabas and some monuments in later periods associated with ancestor worship. Of the three major pyramids were retains its nucleus, consisting of blocks of limestone, but its coating, polished limestone or granite pink, only a few remnants, because these blocks were used to construct buildings in the nearby city of Cairo. The pyramid Jafra (Kefrén) seems highest, but because it was built on an area of the highest plateau of Giza, in reality, is awarded Jufu (Cheops) of greater height and volume. The Great Pyramid was regarded in ancient times one of the Seven Wonders of the World, and is the only one of the seven that still lingers.